Even the cat hates those boots. JMS has left the building, so what’s to become of Wonder Woman? After a undergoing a tacky Hollywood-style makeover, the Amazon Princess is now in writer Phil Hester’s hands. He’s got his work cut out for him. But though the House of Wondy remains under (re)construction, Hester’s debut with issue #605 is a hopeful sign. After a blood-and-bullets themed sojourn through the desert and the underworld, Gen Y Diana returns to her life of a quiet apartment and good works. Her overbearing Amazon guardians aside, it’s a pleasant existence. She’s got a haughty, talking cat, an iTouch and a lot of DVDs. She listens to terrible emo music and loudly sings along. She also sneaks out to do good works, and her fundraising tactics are a little unorthodox. Remember; this ain’t your mother’s Wonder Woman — or yours, for that matter. Visually, this issue is inconsistent, thanks to the big group of contributors. Lead illustrator Don Kramer draws Diana’s face beautifully, but her breasts seem to increase a cup size every month. G3 has absolutely nothing against full bosoms, but given this Wonder Woman’s otherwise slender, athletic body, the rack looks comical. There are also a couple of panels where the illustrations look rushed, and not in a cool, abstract way. Lots of artists struggle with drawing iconic characters as children, and that’s the case here. In a flashback to Diana’s youth, her facial structure seems too mature for an 8-year-old, and it’s distracting. Wonder Woman #605 is a mixed bag, but there are nuggets of promise and redemption in Hester’s first issue. At the very least, I’m not dreading #606. Holy Henrietta Pussycat Batman (meow meow). I tried SO hard to love the Wonder Woman series. I love the character, but her title has been sooo mixed. Even Gail Simone’s run was all over the place. I dropped the book before JMS came on then picked it up again to see what he’d do with the character. But it was so tedious I ended up giving it away again. I’ve love to say I’ll check out Hester’s run but I don’t want to spend another $2.99 ($6.60 here in Australia) an issue on a so-so book. I hope DC can figure out what that want to do with Diana soon and just deliver good stories. At the moment it feels like they’re making it up as they go along. 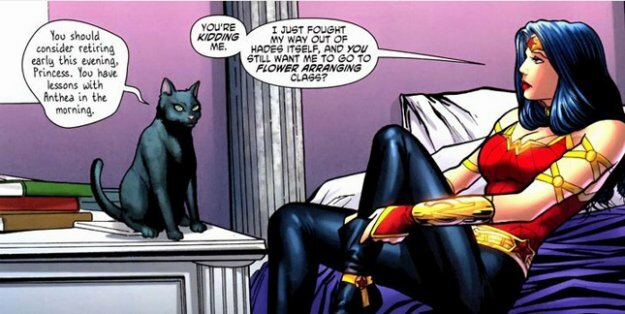 Wait — she has a talking, black cat? What is this…, Diana, the teenage Witch … err, Amazon?? Ugh. I am glad I’m not reading that dreg. I have my fingers crossed that this book is on its way back from CrazyTown. I certainly can’t blame people for taking a pass on this run, especially at $6.60 a pop. That’s a LOT of money, Joe! Like you said, all we need are some consistently good stories. If Batman can have a truckload of books, many of them at least good, why can’t Wondy have ONE decent series?